Images taken inside a transit camp near the Greece-Macedonia border show the impact of Europe’s inaction in addressing the spiraling migrant and refugee crisis. Up to 14,000 people live in the makeshift tent city located near the town of Idomeni, on the Greek side of the border, equipped to house about 2,000 people. Many of the migrants and refugees in the camp arrived there after crossing the Aegean Sea from Turkey to the Greek islands, and hope to enter Macedonia and continue across Balkan countries — like Slovenia, Croatia and Serbia — toward more prosperous European countries like Germany. But that has recently become impossible as the Balkan countries recently shut their borders or tightened frontier policies to people without valid travel documents. 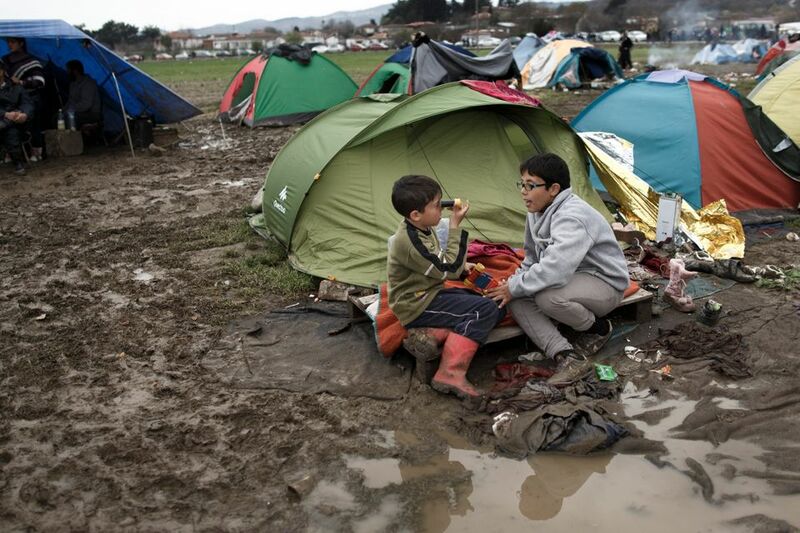 On Monday, hundreds of people stormed out of the Idomeni camp toward Macedonia, hiking for hours and wading through a rain-swollen river, only for many of them to be detained by Macedonian authorities who made them return to Greece. Heavy rains last week flooded the camp, forming puddles around the site. The camp’s portable bathrooms are overflowingand disease runs rampant. Conditions in the camp are grim. Because of the overpopulation, hundreds of people without tents are forced to sleep outdoors, Doctors Without Borders communications manager Vicky Markolefa told HuffPost Greece. 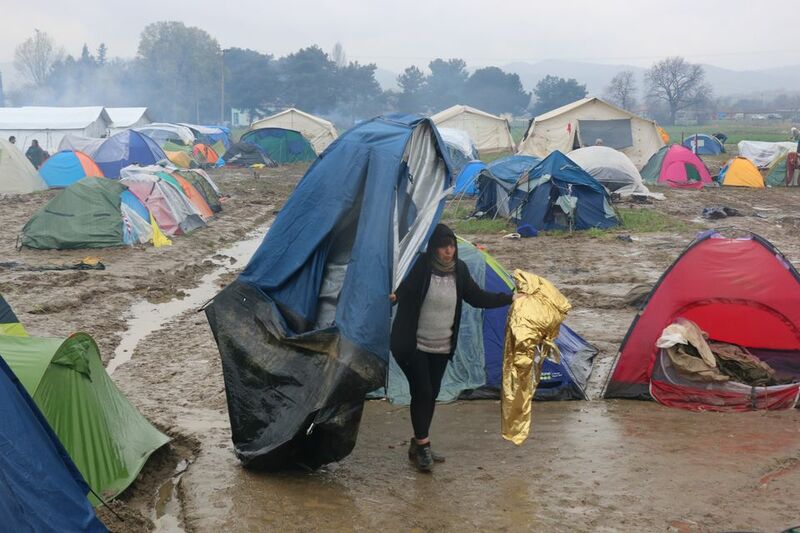 A series of heavy rains last week flooded the camp, soaking tents and forming massive puddles around the site. Portable bathrooms are also overflowing, The New York Times reported. A photo of a newborn baby being washed in cold water circulated widely last week, sparking disgust from social media users and news outlets worldwide. Disease also runs rampant. At least one person has been diagnosed with Hepatitis A, a virus typically associated with poor sanitation and contaminated food and water. “In Syria we die quickly, but in this place we die slowly,” Fatima Ahmad, a woman stuck in Idomeni with her husband and four of her children, told NBC News. 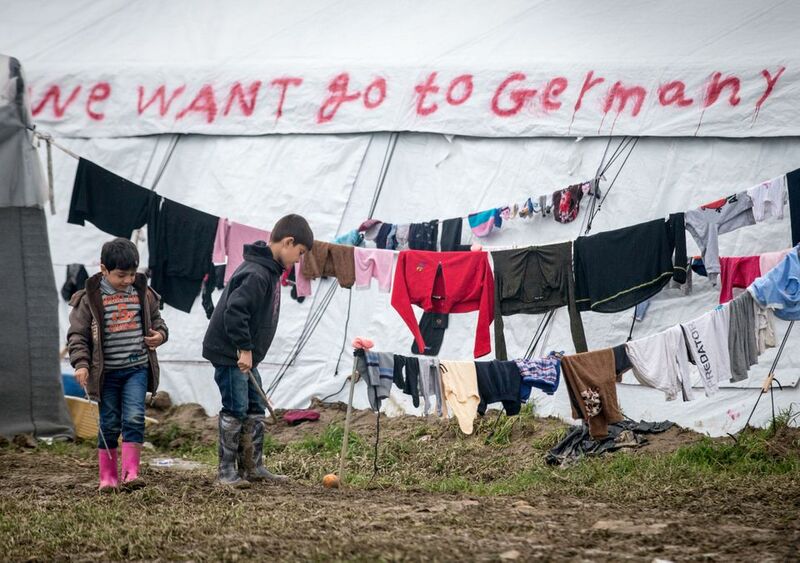 Many of the camp’s inhabitants want to enter Macedonia and travel across a popular migrant route that would lead them to more prosperous countries like Germany. Volunteers on the ground help provide food, clothes and medical care, but warn that demand is surpassing supply as the camp’s population continues to swell. 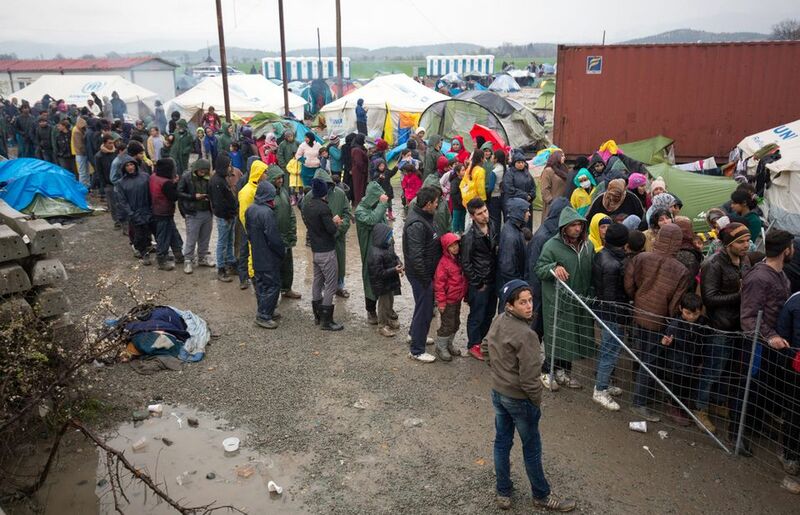 Food lines are almost 500 feet long, MSF’s Markolefa told HuffPost Greece. The Greek government announced last week its intention to relocate the camp’s inhabitants to safer places across the country and its hopes to do so without force. Authorities have started distributing pamphlets urging people to move to other centers across Greece, where the government promised it would offer accommodation, food and health care. Greece said that while some people have already left the camp, many others are waiting for news from Brussels, where EU and Turkish leaders are hashing out an agreement that could see EU countries reducing their refugee and migrant intake and sending people back to Turkey. Over 1 million people have entered Greece since the beginning of 2015, the United Nations announced Wednesday. More than 143,000 of those arrivals are from 2016 alone, the U.N. added. 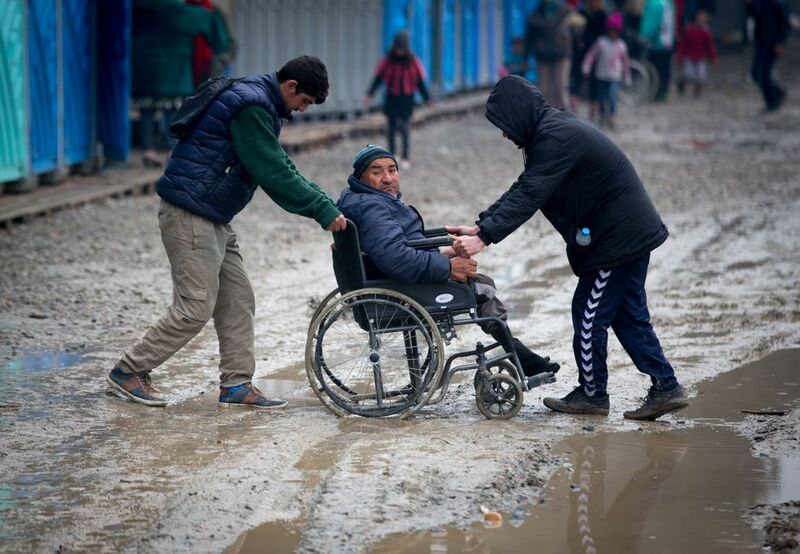 A man in a wheelchair is helped through the mud at the Idomeni transit camp. Newly arrived refugees and migrants take shelter under a train carriage in the camp. 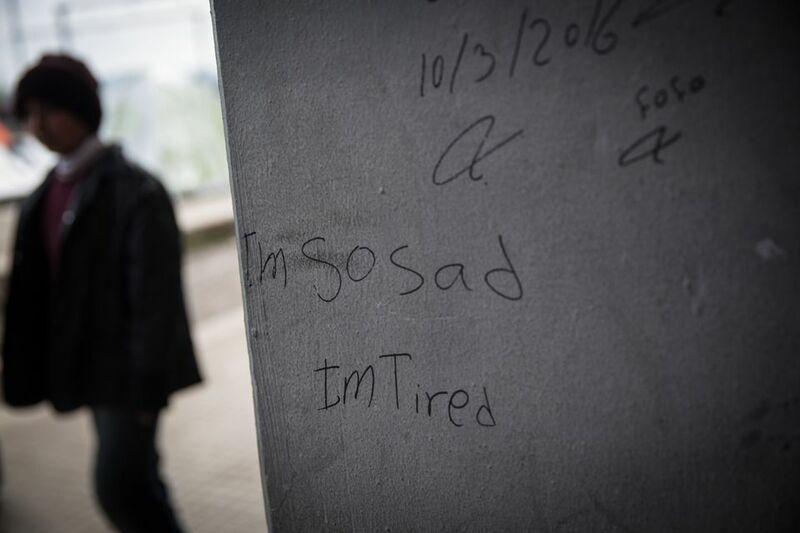 A child walks past writing on a pillar near thecamp.A recent study says refugees are at higher risk of developingmental health disorderslike depression, post-traumatic stress disorderand schizophrenia. 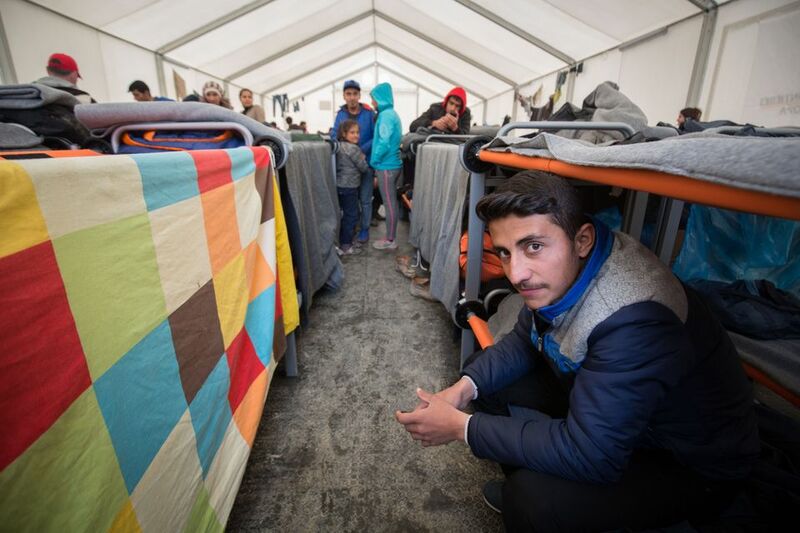 A man sits on a bunk bed inside a crowded tent. 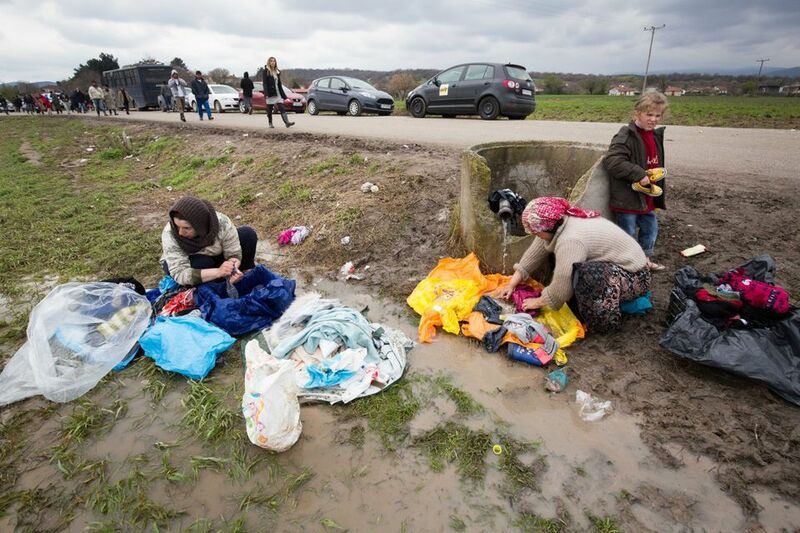 Women wash clothes at a stand pipe, surrounded by muddy water. Refugee children walk along railway tracks in the camp. People line up for food at the camp.Food lines are almost 500 feet long, Doctors Without Borders told HuffPost Greece. A woman carries her tent across the camp.